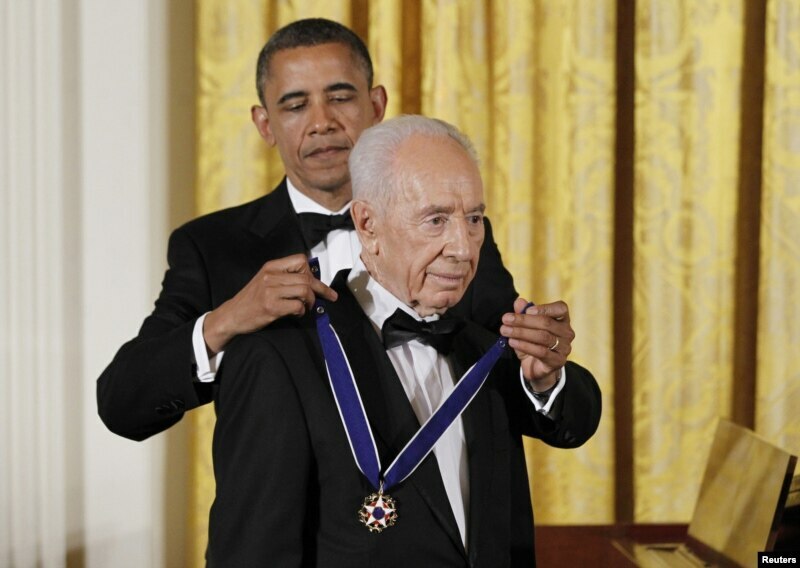 U.S. President Barack Obama presents the Presidential Medal of Freedom to Israeli President Shimon Peres in the East Room of the White House in Washington, June 13, 2012. 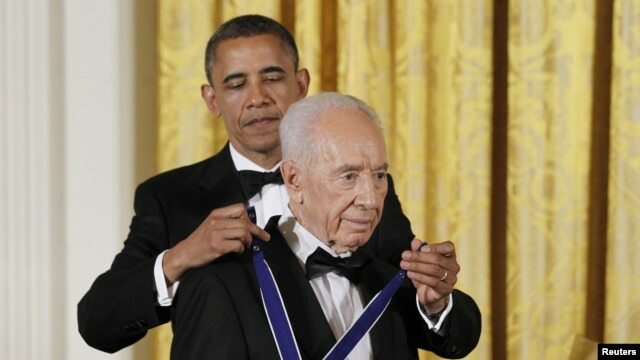 U.S. President Barack Obama gave the Medal of Freedom to Israeli President Shimon Peres in a special ceremony at the White House on Wednesday evening (Washington time). Obama noted that Peres joined the Haganah Jewish defense organization in 1947, when he was in his 20s, and that he ran for President at the age of 83. Peres calls for renewed peace talks in medal ceremony: Receiving the Presidential Medal of Freedom from President Obama, Israeli President Shimon Peres called for a renewal of peace talks with the Palestinians. Peace talks have been stalled since 2010, with the Palestinians demanding a freeze of settlement building in the West Bank, and Israeli Prime Minister Benjamin Netanyahu insisting on no preconditions. In a ceremony at the White House on Wednesday, President Obama awarded the Medal of Freedom to Shimon Peres, the President of Israel. “The man, the life that we honor tonight is nothing short of extraordinary,” President Obama said. Peres began his career in 1947, serving in the Haganah, the predecessor to the Israel Defense Force. He was elected to the Knesset at age 36. Through the course of the next half century, he twice served as Prime Minister and once as Acting Prime Minister. In 1994, he won the Nobel Peace Price with Yitzhak Rabin and Yasser Arafat. President Bill Clinton, Secretary of State Hilary Clinton, former Secretary of State Madeleine Albright (another honoree of the Medal of Freedom in 2012), and Elie Wiesel (another winner of the Nobel Peace Prize) were among those in attendance for the presentation. President Peres joins an illustrious group of world leaders — including Margaret Thatcher, Nelson Mandela, and Vaclav Havel — who previously been presented with the medal. Shimon has been serving his nation — and strengthening the bonds between our two nations — for some 65 years, the entire life of the State of Israel. Ben-Gurion and Meir, Begin and Rabin — these giants of Israel’s founding generation now belong to the ages. But tonight, we have the rare privilege in history — and that’s to be in the presence of a true Founding Father. Shimon teaches us to never settle for the world as it is. We have a vision for the world as it ought to be, and we have to strive for it. Perhaps Shimon’s spirit comes from what he calls the Jewish “dissatisfaction gene.” (Laughter.) “A good Jew,” he says, “can never be satisfied.” There is a constant impulse to question, to do even better. So, too, with nations — we must keep challenging ourselves, keep striving for our ideals, for the future that we know is possible. At times, some have seen his hope and called Shimon Peres a dreamer. And they are right. Just look at his life. The dream of generations, after 2,000 years, to return to Israel, the historic homeland of the Jewish people — Shimon lived it. The dream of independence, a Jewish State of Israel — he helped win it. The dream of an Israel strong enough to defend itself, by itself, against any threat, backed by an ironclad alliance with the United States of America — he helped build it. The dream of making the desert bloom — he and his wife Sonya were part of the generation that achieved it. The dream of the high-tech Israel we see today — he helped spark it. That historic handshake on the White House lawn — he helped to create it. That awful night in Tel Aviv, when he and Yitzhak sang a Song for Peace, and the grief that followed — he guided his people through it. The dream of democracy in the Middle East and the hopes of a new generation, including so many young Arabs — he knows we must welcome it and nurture it. So, yes, Shimon Peres — born in a shtetl in what was then Poland, who rose to become President of Israel — he is a dreamer. And rightly so. For he knows what we must never forget: With faith in ourselves and courage in our hearts, no dream is too big, no vision is beyond our reach. And so it falls on each of us — to all of us — to keep searching, to keep striving for that future that we know is possible, for the peace our children deserve. Shimon, to all our friends here tonight, and to our fellow citizens across America and Israel — may we never lose sight of our destination. Shalom, and may we always be as young as our dreams. It is a testament to the historic friendship between our two nations. When I was really young — not like now — (laughter) — the founder of the State of Israel, David Ben-Gurion, called me to work with him. For 65 years, inspired by his leadership, I tried to gather strength for my country, pursue peace for my people. I learned that public service is a privilege that must be based on moral foundations. I receive this honor today on behalf of the people of Israel. They are the true recipients of this honor. With this moving gesture, you are paying, Mr. President, tribute to generations upon generations of Jews who dreamed of, fought for a state of their own — a state that would give them a shelter; a state that they could really defend by themselves. Dear friends, Israel sincerely admires the United States for being a land of the free, a home of the brave, a nation of generosity. A world without the United States, without the values of the United States, would have been chaotic. Moses began his journey to freedom by demanding, “let my people go.” The prophet Isaiah promised nations will take up swords against nations. A biblical promise became a grand American reality, first and foremost in human annals. When the Liberty Bell rang in Philadelphia, it resonated throughout the world. A tired world was surprised to witness, contrary to its experience, a great nation becoming greater by giving, not by taking; by making generosity the wisdom of policy, and freedom as its heart — freedom from oppression, from persecution, freedom from violence and evil, freedom from discrimination and ignorance; liberty that does not fear liberty, liberty that doesn’t interfere with the liberty of others. You introduced a constitution based on balance, not on force. We are faced with the worst of humanity, but also experience the best of humanity. We shouldn’t forget either of the two. When we discovered that we were short of land and water, we realized that we had the priceless resource — the courageous, undefeatable human spirit. We invested in knowledge and turned our attention to the ever-growing promise of science. Unlike land and water, science cannot be conquered by armies or won by wars. In fact, science can make wars unnecessary. Science provided Israel with the unexpected economic goals — it enabled us to absorb millions of immigrants. Science enabled us to build an agriculture that is ten times the normal yield. It enables us to build an effective defense against armies ten times greater than us. Brave soldiers and sophisticated tools brought us victory in life. Friends, extremists are using the conflict of the Palestinians to cover their true ambitions. The majority of the people in the Middle East, in my judgment, are tired of war. In many homes, families still mourn the loss of their loved one. I believe that peace with the Palestinians is most urgent — urgent than ever before. It is necessary. It is crucial. It is possible. A delay may worsen its chances. A firm basis already exists. A solution of two national states — a Jewish state — Israel; an Arab state — Palestine. The Palestinians are our closest neighbors. I believe they may become our closest friends. (Applause.) Peace with the Palestinians will open ports of peace all around the Mediterranean. The duty of leaders is to pursue freedom ceaselessly, even in the face of hostility, in the face of doubt and disappointment. Just imagine what could be. So, President, my vision is an Israel living in full, genuine peace, joining with all the people in the Middle East — former enemies, new friends alike; Jerusalem becoming the capital of peace; an Israel that is a scientific center open to all, serving all without discrimination; a green Israel, an increasingly green Middle East. My vision is an Israel whose moral code is old as the Ten Commandments tablets, and whose imagination as new as the digital tablets as well. (Applause.) Together, our old and modern vision can help bring tikkun olam. Mr. President, that’s a better world. It will take a long time before we shall achieve it and become satisfied, as you have said. I believe that in the coming decade, Israel will be a center of the latest development in brain research. As the secrets of the human brain are being revealed, people may improve their capacity to choose between right and wrong. By the way, I am also extremely optimistic about the United States of America. You are going to be the real greatest source of energy in our time. You are introducing a new industry, which is not mass production but individual production. It’s a new revolution. And you put again science on top of your agenda. I believe in the coming decade, Israel will be also a center of the latest developments in brain research. As the secret of the human brain are revealed, people may improve their capacity to choose between right and wrong. And absent of a global government — government can contribute to world peace.